The Clint Administration: It goes without saying that Clint Dempsey, who scored the only goal of the match, is the best active American soccer player. He has been immense for Fulham this season, making an impact both on the score sheet (logging 10 goals and four assists in 26 league matches) and giving the Cottagers some on-field swagger. Beyond that, Dempsey is also becoming the iconic American player. For years, it feels like the sport has been searching for some kind of totemic figure — Adu, Donovan or Altidore — who would galvanize the nation and turn us all into scarf-waving, drum-banging Outlaws. But we already have one. Dempsey is a fantastic combo of bass pro, Texas rapper (DEUCE! ), and near-great Premier League performer. What more could you ask for from the face of American soccer? but can they fight?” I always thought the inverse was true of the USMNT central midfield. They were tenacious, competitive, and full of fight; they just weren’t all that pretty. On Wednesday, however, Maurice Edu and Michael Bradley were both of those things. The pair not only applied pressure to the Juventus duo of Andrea Pirlo (one of the best central midfielders of the last 20 years) and Claudio Marchisio (one of the best midfielders in Italy), but actually mustered some rather attractive through balls to Jozy Altidore and Brek Shea. Edu, who makes his living playing for Rangers, was especially surprising with the quality of his passing. it was friggin’ Italy! In Italy! The USMNT had never beaten the Azzurri. Have a Peroni and enjoy it, you know? The person who gained the most out of this match was Klinsmann. For a man who recently said, “I don’t give a crap about win records,” this was a really nice win. Other than a three-goal performance against Slovenia, Klinsmann still hasn’t gotten the USMNT scoring in the fashion many fans were hoping for. 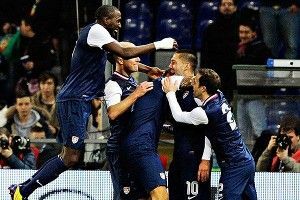 But he has strung together four straight victories, and, with this defeat of Italy, shown that under his stewardship, the USMNT can at least compete with some of the world’s most revered teams.